Who cares about the Academy Awards, Golden Globes and Grammy’s? It’s literary award time. And the mother of all literary awards for children’s authors of color, the Coretta Scott King Award will be given during the annual ALA Mid-Winter in just about a week. We here at the Brown Bookshelf have a vested interest in the CSK. Not only because we’re writers and illustrators. But because, it’s a pretty small lit community and life could very well change for an author among our 28 Days Later contenders. So we have our eyes open. But, the only thing more fun than finding out who’s won an award is trying to predict who will win. So we thought we’d give our predictions for CSK winners. Now me, I’m not a gambling gal. And, I’ve looked at the list of past winners enough to know that there are certain types of books that have a better chance of taking home the honor. Add those two elements together and you end up with a prediction that’s about as safe as it gets. 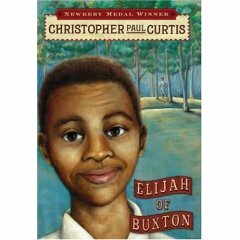 Christopher Paul Curtis will take home the CSK Author awardfor Elijah of Buxton. 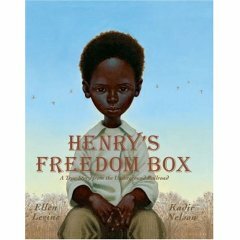 For the Illustrator Award, I have a toss up between Bryan Collier for Uptown, Kadir Nelson for Henry’s Freedom Box and E.B. Lewis. I’m going to give the edge to E.B. Lewis for Pitching in for Eubie. 1) Christopher Paul Curtis and all of my illustrator top picks are past CSK recipients. Fact: Those who have won a CSK have a higher chance of winning one again. Nikki Grimes, Kadir Nelson, Mildred Taylor, Bryan Collier, Sharon Draper, Walter Dean Meyers, Angela Johnson and Jerry Pinkney are all multi-CSK recipients. Which means, in a year they wrote/illustrated a book, everyone else better hold their breath. 2) Elijah of Buxton is an excellent book. And you’re thinking that should have been #1. But the truth is, all of the recipients and honor books are excellent books. It’s a given. That’s why it’s the #2 reason. 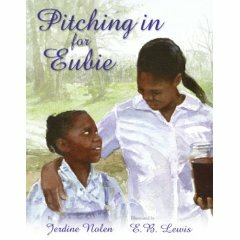 3) The illustrations in Pitching in for Eubie are clean and crisp. There’s something about simple illustrations that really attracts my attention. It’s true that art is one of those types of things where you may not know what makes it good, but you do know when you’re looking at a really good piece of it. 4) M. Sindy Felin is a new author. But her book was a National Book Award Finalist, which is bound to bring attention to it. And because it deals with the issue of being a black immigrant in America, it’s a topic that’s new to the CSK mix. It could pump some fresh blood into an award that’s, for the most part, been focused keenly on the African AMERICAN experience. So, let the predicting again. I’ve been known to be wrong…once. Okay, maybe twice. Good choices. I’ll post my thoughts later this week. One thing, Uptown has already won, three, four years ago…lol! I haven’t read it yet but like you said, being a Nat’l Book Award finalist piques my interest even more. Fuse #8 is doing Caldecott and Newberry predictions. Check out what she says about Elijah of Buxton. I’m hoping she’ll dip her toe into CSK predictions. Janice Harrington (Chicken-Chasing Queen of Lamar County). Janice’s first PB won several awards including the Ezra Jack Keats. Her second book, Chicken Chasing Queen . . . , has lots of buzz and good reviews. I think the award committee may give her the nod for exploding onto the scene with two great, critically-acclaimed PBs. Plus, she’s a former librarian. Not sure if that helps, but it might be rewarding to recognize a wonderful new author who came from their ranks. Kel, can Harrington win the Steptoe if she’s already done PBs? Or is the window for “new” author longer than one year? From what I read about Steptoe, it’s more of if they have not ever won the Steptoe or CSK before. At least, that was my understanding. I too would like to see Harrington win as well. I just love the title, lol. The Steptoe is awarded to an author or illustrator with more than three published works. Chicken Chasing Queen . . . is Janice’s second. So she’s a contender. Ahh okay, it’s based on the number of books you have. Makes sense. Oops. My post should have said “with no more than three published works.” That’s what I get for rushing ;). 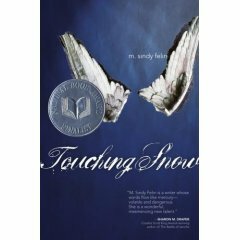 I have my fingers crossed for Touching Snow by M Sindy Felin. The first line is a punch, and author still finds a way to keep the writing strong. I felt like I was back in the 80’s and its different then a lot of YA books by African American authors. The book is realistic fiction at its finest. Though, I liked Elijah of Buxton by Christopher Paul Curtis, (cried at end) Its not the first nor will it be the last story that is set during the time of slavery. I do believe these stories are very important so children who read them can ask questions, better understand the past and current conditions. However I think it would be nice if Touching Snow won because than maybe more books of its kind can be published. I believe realistic fiction is as important as historical fiction. It may force a reader to ask internal questions, maybe even turn on a light thats been dim for too long. I want to love more African American authors the way I love Laurie Halse Anderson and Sarah Dessen my heart is warm with hope for the YA reader who needs and finds their novels. This christmas I helped a customer pick out two books for her son. Tyrell by Coe Booth and Rules of Survival by Nancy Werlin. I think I floated home that day, it doesn’t get any better than that. Those are exactly the type of things I love to hear. That readers are out there waiting for these authors. And the authors are here, they’re just not quite as well-known…yet!